We had a cold, wet spring in the northeastern United States this year. With that rain came standing water, and the standing water was a breeding ground for this summer’s bumper crop of mosquitoes. For us New Englanders, mosquitoes are mostly a nuisance; for residents of other parts of the world, however, mosquitoes bring disease and death. One mosquito-borne disease responsible for thousands of deaths, and tens of millions of infections each year, is Dengue fever. One of a number of infectious diseases carried by mosquitoes, it’s a leading cause of illness and death in Puerto Rico, Latin America, Southeast Asia, and the Pacific Islands, according to the United States Centers for Disease Control (CDC). When caught early in patients, prompt treatment can substantially lower the risk of medical complications and death. One solution for controlling Dengue fever is to eradicate all mosquitoes. Given there are 3,500 species of mosquito it’s an idea that may not work. One Singaporean scientist has another, more practical, idea and his team’s research is opening up new paths of discovery. Dr. Ganesh Anand is a structural biologist and an associate professor in the Department of Biological Sciences at the National University of Singapore – a country well-acquainted with Dengue fever. So when Dr. Anand’s research team published papers in Nature Communications and Structure they stirred excitement among infectious disease researchers by revealing something new about viruses that hadn’t been understood before. 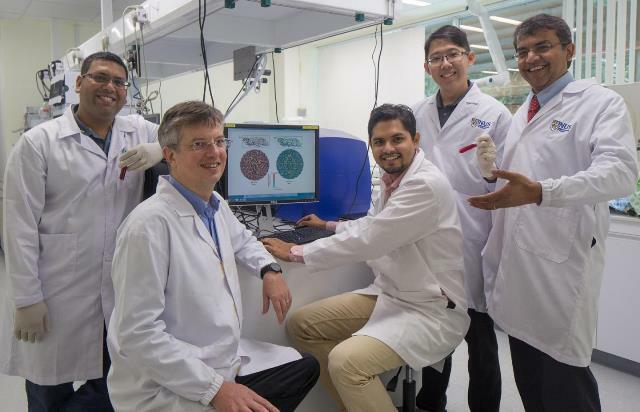 Thanks to this team of researchers at the National University of Singapore, the Dengue virus is no longer as good at keeping secrets. 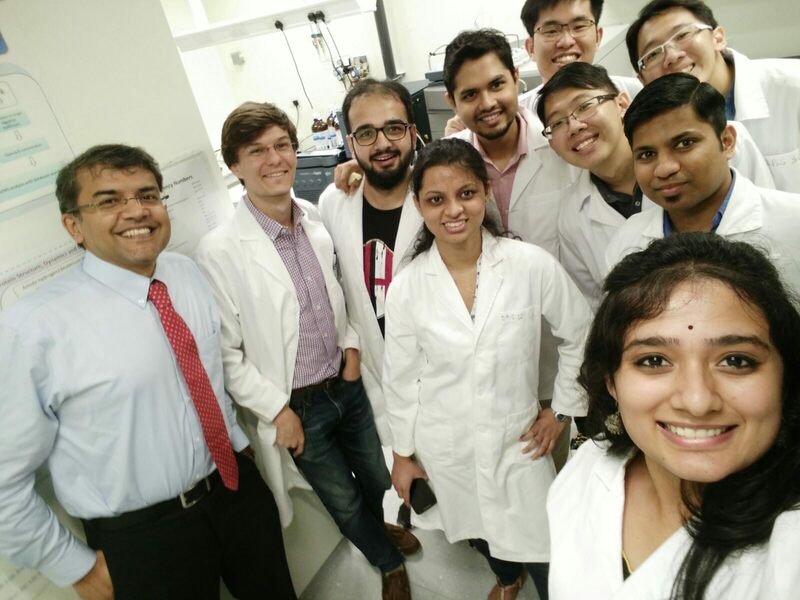 Shown are (back row, left to right) Ganesh S. Anand, Isaac Kresse, Abhijeet Ghode, Arun Chandramohan, and Gideon Yosua Purwono; (middle row, left to right) Madhubrata Ghosh, Xin Xiang, and Xin Shan: (middle foreground) Nikhil Kumar Tulsian; and (taking selfie) Ranita Ramesh. “Dengue fever is prevalent here in Singapore. I’ve never contracted it but I know students who have. In India, where I grew up, and in the rest of the tropics, it’s a huge problem. If you recover from the initial infection, it usually doesn’t cause any lasting problems. What you have to watch out for are the second infections, which can be life-threatening,” Dr. Anand says. One question that has always intrigued Dr. Anand is how does a seemingly rigid particle like a virus that has no sensory organs like eyes and ears, realize when it has entered a human host and know it’s time to enter its infectious phase? To his surprise, and fascination, the answer to that question is: temperature. When an infected mosquito bites its victim, the mosquito transmits the Dengue virus in its salivary glands into the bloodstream of its host and that starts an incubation period of several days during which the virus begins replicating. That swelling or expansion of the virus capsid is irregular and the gaps, or vulnerabilities, that appear on the three-dimensional surface aren’t that easy to spot, even for the most powerful microscopes. That’s where ion mobility hydrogen-deuterium exchange mass spectrometry comes in. No stranger to mass spectrometry, Dr. Anand has pioneered one technique that has proven valuable for characterizing not only how molecules are put together, but how they are shaped. “We had done a lot of previous work on harmless bacteriophages using ion mobility hydrogen-deuterium exchange mass spectrometry (HDX-MS). We knew how valuable it is for studying bacteriophage particle dynamics. So before we decided to use it on the Dengue virus, we knew what to expect and what challenges we were likely to encounter,” he said. Dr. Anand explains how HDX works: “We take the viral particle and blast it into small pieces with pepsin, and then track how much deuterium is exchanged for hydrogen by the fragment peptides. Each of these peptides represent reporters, which tell you where the expansion is occurring the most and where the action is. With the data processing software we can reassemble the virus particle and accurately pinpoint where on the surface most hydrogen-deuterium exchange occurs. These sites represent possible vulnerabilities or targets. We call them HDX hot spots,” he said. Ganesh Anand and members of his research team at the National University of Singapore celebrate the publication of their Nature Communications article. As Dr. Anand explains, viruses are tricky to work with. “One major constraint in working with viruses is that they tend to resist being super concentrated and become aggregated. “Mass spectral sensitivity is a prerequisite for our studies and the Waters SYNAPT G2-Si mass spectrometer proved fantastic and critical for us to be able to visualize viruses by HDX because of its exquisite sensitivity – we never really had to get to very high concentrations of viral particles in solution. For this study, we used dengue virus particles at a concentration equivalent to 0.25 mg/mL of the envelope E-protein, 180 copies of which form the envelope of each virus particle,” he said. What’s next for Dr. Anand’s unlocked Dengue virus? “So, now we can begin to mine some of these hot spots for designer therapeutics or antibodies. We have recently published the epitope and paratope of a neutralizing antibody that finds the envelope protein of Dengue virus. The powerful aspect of this story is that we have captured how the antibody engages the entire viral particle,” he said. Dr. Anand’s team’s papers in Nature Communications – and now Structure – have stirred a lot of scientific discussion and interest. “We’ve received a lot of positive feedback from all over the world. Wherever I’ve given talks, the virologists and immunologists in the audience are quite amazed and excited – I mean, no one associates mass spectrometry with this level of visualization. They’re extremely aware of the implications for targeting viruses of all kinds,” he said.